Grease bottom of a 9 x 13- inch baking pan with non-stick cooking spray. In a medium bowl, combine brownie mix, eggs, yogurt, and vegetable oil. Stir with a spoon until well blended. Stir in mint pieces. Pour batter into prepared pan. Bake 22 to 28 minutes or until a toothpick inserted in center of brownies has moist crumbs attached. Allow brownies to cool completely. Cut into small pieces. Combine pudding mix and milk in a medium bowl. Mix according to package directions. Combine cream cheese, yogurt and powdered sugar in a small bowl. Beat with electric mixer until well blended. Use a vegetable peeler to make small curls by shaving down the long edge of the mint. 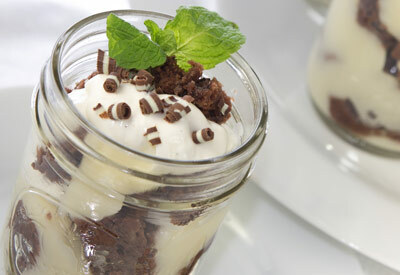 Layer the pudding and brownies in a 3- quart trifle bowl in two layers. Spoon the topping over the top layer. Decorate with mint curls. Cover and chill until ready to serve. Add a sprig of fresh mint if desired.